Turn any blog into an object of protest! Click here (via Eszter). * BTW: The idea of March going in like a lamb, out like a lion (or vice versa): is that a rural thing, a Midwestern thing, a more broadly American thing, or a more broadly everywhere thing? Great cartoon reposted by Drek on the difference between "scientist" and "normal person" (link). Only I think Drek's conclusion about it is not correct. The "scientist" would not repeat the task a dozen times; instead, after the second or third, the question would change to "I wonder if it would still happen if I [insert slight variation here]." Dan also links to this cartoon, with his own elaboration. Reading the Veronica Mars episode guides for the episodes that I have not yet seen. So, that's over with, and I can return to the rest of my life. Hey there, life, good to see you again. in surf city it was two girls for every boy; in soc city it's three retirees for every new ph.d.
"Since 1993, the 'replacement rate'--the ratio of the annual number of new PhDs awarded to the number of PhDs retiring--has steadily declined in all social science disciplines. Figure 1 shows the replacement rate between 1993 and 2003 for these disciplines. ... By 2003 (the last year for which data were available), there were two-thirds of a new psychology PhD for every PhD psychology retiree. In contrast, there was less than one third (.29) of a new PhD for every one PhD retiree in sociology." 1. My sense that, in certain institutional respects, the experience of my broad cohort in sociology has resembled that of a game of musical chairs, only except instead removing chairs, removing people. 2. The increasing difficulties editors report in finding people to peer review articles. I uploaded a recent article in the New Republic on Freakonomics and economists fretting about the rise of cute little studies in their discipline. My stance, which I did not do an especially good job of articulating in this panel of Freaknomics at the Eastern Sociological Society meetings, is that sociology should, at least from a strategic standpoint, be on the side of the freakonomists in their battle against the structural-modellers in economics, because the former stakes out a position that is far more congenial to prevailing tendency of sociologists to be stronger with understanding data and process than they are at math. 346. A Veronica Mars addiction. 347. An Arrested Development addiction. So, back in 1998, my then-girlfriend bought me a TV tuner card as a present. I bought cable TV to go with it. This was whatever month the Women's World Cup was where the US won and Brandi Chastain took off her shirt at midfield. Anyway, I got sucked in and watched like every televised match of that World Cup, developing actual feelings about who would win the Ghana-Uzbekistan match. Then, after the championship, I discontinued cable. I think I need to bring television into my life every 5-10 years to remind myself why I don't have television in my life. Remember how after the fall of Communism, multilevel marketing schemes got introduced into places that had never had them before, and it was like unleashing a virus onto a population that had no antibodies to it. 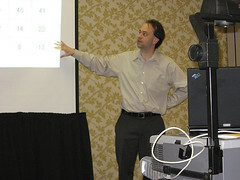 Well, the SAT analogy problem would be TELEVISION:JEREMY::AMWAY:ALBANIA. * Argh. Don't even think I am going to start on any of the other shows you recommended to me when I started Netflix. Suffice it to say that the plan where I was only going to watch shows while I worked out has run aground on the shoals of low self-discipline. I think I'm going to watch these series and then cancel Netflix. It's warm enough I can run outside anyway. * Do the SAT and GRE still have analogies, or am I dating myself? They got rid of the antonyms but kept the analogies, right? My ability to figure out magic tricks increased greatly the day I realized that magic tricks are optimal in an important sense. A trick is basically as impressive as it can be without giving away its secret. When the magician saws the woman in half, the parts you can see are all you can see. If the trick would be even more impressive if the woman wiggled her toes but she doesn't wiggle her toes, there's a reason there's no toe-wiggling. It's distressing the extent to which I have been able to export this epiphany to the evaluation of quantitative social science. I was recently talking to a colleague who does not do quantitative research about a paper we had both, in very different contexts, read. The paper addressed its substantive question using Approach A. It could have used Approach B instead. Approach A is good enough for the standards of where the paper was published, but Approach B would be the approach preferred by more quantitatively-discerning types. The paper acknowledged the existence of Approach B but made substantive and statistical arguments for why Approach A was superior. In talking to my colleague, I explained that these arguments were really not very good arguments, and that, indeed, people who understand the technical issues are not going to very persuaded by results from Approach A because you really need results from Approach B to be able to assert the conclusions of this paper with any real confidence. The thing, though, was that I went on to take for granted that analysis using Approach B wouldn't yield statistically significant (i.e., publishable) results. My colleague asked how I could be so certain of this, since no results from Approach B were reported in the paper. I replied that, if Approach B would have yielded the same results as Approach A, the author would have announced this fact to assuage the concerns of people like me. Especially because the author clearly understands how to do Approach B and it would have only taken, say, five minutes to check. So when I saw that the paper contained these weak arguments for the superiority of Approach A over Approach B, and made no mention of what the results would have looked like using Approach B, I read this as basically equivalent to the paper containing a giant invisible footnote that said "We tried Approach B and it doesn't work." So, in a recent post, I fretted about having completely forgotten about having read a book--not just not remembering I had read it but not even being able to remember having read it after looking at my own underlining and margin notes inside it. I mean, forgetting you'd read something is one thing, but looking through it again and at one's markings and still having it remain resolutely foreign, that's another. Now, the kicker: a friend just e-mailed reminding me that, in fact, I've posted before about having opened up this very same book and having no recollection of ever having read it, but I had forgotten all about having done this. So I read the book, forgot about reading it, forgot about having already once marveled about having forgotten all about reading it. Fortunately, at least, I did remember writing the earlier post once I was reminded of it. While [Louisville basketball coach Rick] Pitino acknowledged leaving Kentucky following the 1997 season was a "mistake," he joked that at age 54 he's "too old to leave" Louisville, but understands why there's so much speculation about his interest in the job. "It's a great job. I had eight years of Camelot, I've said that," he said. "It's the Roman Empire of college basketball." At 6:12pm this Sunday, my wisc.edu/harvard.edu inbox, my IMAP "ACTION BIN" (where I am supposed to put e-mails I cannot dispense with quickly), and my GMail inbox are all empty; their accumulating contents having been successfully dispatched in a super-secret and super-surgetacular "Operation: Spring Cleaning" campaign. I'm not sure when the last time was I had empty inboxes. We might have to go back to the early years of graduate school, when e-mail was on a VAX and not everyone was using it. I am giddy. I feel like taking a short run around the building here shouting "Free! Free!" I am through 4 weeks of my scheduled 10 week diet, and I am down 9 pounds. In addition to eating a pound of carrots every day I am at the office, the main staples of my diet are Lean Cuisine meals and Breyers light yogurt. When I go out to eat, I restrict my attention to the salads. Coke Cherry Zero remains my loyal companion, although one should ignore rumors that our relationship is anything more than strictly platonic. The upcoming week should be relatively easy, but then the week after that is followed by a couple of trips, which is where I teeter closest to caloric-conscious-lifestyle ruin. Confession: While not perfect, I've done pretty well at sticking to this diet. 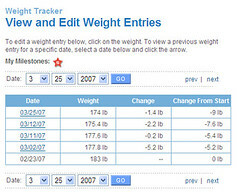 No way I would be doing as well if not for me announcing that I was going on a diet on this blog and knowing that if I fall off the wagon I am going to have to pronounce that to whoever reads this. Another way that having a blog has improved my life. maybe that day the homunculus who lives inside my head forgot to press "record"
This blog will not be taken over by my anxieties regarding aging. But: another social science blogger recently posted a rousing review of a certain book that I've owned for maybe three years. I thought, "You know, I really should read that." So I pulled it off my shelf today along with a couple of other books so I could move them to my nightstand where they would, like most books on my nightstand, remain unread but still be in a kind of well-intentioned queue. Then I opened the book and saw it had all kinds of underlines and notes in the margin in my writing. I've done this before. But here, even as a flipped through it again and looked at my margin notes, it jogged absolutely no recollection of ever having read the book before. Nothing, even sentences that warranted circling with three asterisks and an exclamation point in the margin, rang any bells. None. Zero. If not for the irrefutable evidence of my own markings inside the book, I would testify under oath that I had never read it. This just increases my conviction that I need to start moving my brain into Microsoft OneNote 2007 as much as possible. Not that I think it's that great a program, but I need to put my brain somewhere and I don't know of any better software alternative. So, do I read the book again, since I wanted to read it and it's like I've never read it? Or do I assume because I don't remember reading it that it can't be that useful? So, I remember back when I was in my twenties I would have a crisis and say, "I'm having a midlife crisis" and it was a joke. Now, I've reached the point where I say "I'm having a midlife crisis" and it's a hypothesis. I'm thinking about buying a Wii. Thoughts? I have a friend whose pseudonym for the purposes of this anecdote is Cookie Smart. She sent me an e-mail this morning saying that she had just received a letter from the IRS that the name on her tax form didn't match the provided taxpayer ID number. Turns out that instead of filing her taxes as "Cookie Smart" she filed them as "Smart Cookie." She was e-mailing because she wanted to know if this is the sort of thing I would do. I told her that while I had never made that particular mistake, it did indeed sound like the sort of thing I would do, except for the fact that she'd already filed her taxes and it isn't even June yet. I use the phrase "Jeremy Tax" for the amount of extra money I have to spend each year to solve problems caused by my absent-mindedness. The latest Jeremy Tax payment was for the cable for my digital camera I lost. Despite being missing for more than a week, the missing cable predictably turned up a few hours after I placed the order online. Three people in the past month or so, independent of one another and with various degrees of committment to the idea, have mentioned to me the possibility of doing an ethnographic study of funeral homes. If you, too, are working on this topic, I guess I would urge you not to dally. Is this social science having a late-blooming Six Feet Under effect? Have funeral homes always been an attractive topic for ethnographers but something about the topic has prevented their from being (to my knowledge) The Great American Funeral Home Ethnography? As a different matter regarding ethnography, I was having a conversation with an acquaintance recently about a prominent sociology ethnography in which the author, with the consent of the research participants (members of a minority group living in poverty), used their real names. The acquaintance was of the position that this was definitely wrong and asserted that their view was the consensus among people who do ethnographic research. I have to admit I don't really understand this as a general position. I do understand it in the obvious, but special, case in which naming an informant would allow one to determine the identities other people who don't want their names used. Otherwise, it seems like newspaper editors have the right idea in fretting about negative consequences of anonymous sourcing; namely, that there is basically no accountability for the writer to represent the source accurately rather than tweaking statements in ways that suit the author's argument. I recognize that people who do interview-based studies get very cross when someone says "I think you're just choosing quotes that fit your argument" or, worse, "How do we know you aren't just making this up?" But, irritation is not quite the same thing as counterargument. I can understand the idea that confidentiality is unfortunately what must be offered to get interviewees to provide honest participation, but the idea of swaddling it in ethicky goodness even for participants who express no reluctance about speaking on the record--this I don't buy. "Do you really think our cohort is sassy?" "I guess--I guess it's just that Jeremy is really sassy." 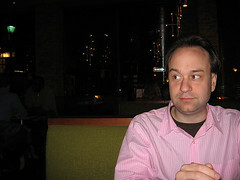 So, I've worn a pink shirt every time I've presented in the RWJ seminar, which started out from my joke that a social psychologist should wear pink when presenting to economists because of evidence suggesting it lowers aggression and then has taken a life of its own. 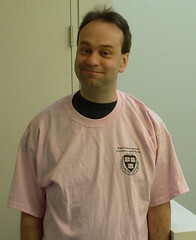 Now, one of my fellow fellows took it upon himself to make T-Shirts for the group and decided to make them pink as well. 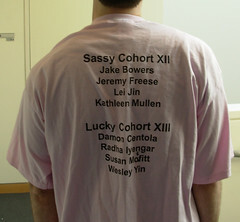 My cohort is identified as "Sassy Cohort XII" on the back. One of the members of Cohort XIII's name is spelled wrong, which just proves the maxim "Check spelling twice, print T-shirts once." I think he should have put at the bottom, "A well-endowed foundation sent me to Harvard and all I got was this T-shirt! ", perhaps adding "(and a nice salary, office space, a research budget, and assorted perqs)" in a smaller font underneath. And yes, I will continue to spell it "perqs" until the bitter end, although I have mostly given up my quixotic fight for "cel" phone instead of "cell" phone. A common diversion among some friends of mine is to offer unsolicited opinions over whether the time has come for me to end my scalp's recession and just start shaving my head. A friend who had been identified with the idea of my not just shaving my head but using laser hair removal to do it recently sent me this photo that she had taken of me. She said the photo provided a good idea of what I would look like with a shaved head and, on the basis of it, she had changed her mind and I shouldn't do it. Which was good of her to express her opinion, although it's not like shaving my head was an alternative or fall back option, but rather something I am presuming I'll feel compelled toward sooner or later, albeit preferably later. All this just reinforces the idea that what I should really do is disappear for a year and come back with a giant thick curly head of hair and a plummy British accent. You think I'm joking. "[name] joined Weight Watchers Online." "Yes, although I just got a text message saying, 'Man, I didn't realize a Qdoba chicken burrito was 27 points!'" "I only get 19 points for an entire day." * I realize what a weird phrase "tide me over" is as I type it. It is "tide", right? Not "tied" or "tyde"? Liberal élitism, he said, as he stirred Sweet 'N Low into his tea with a chopstick, alienates middle-income families from the Party. Nice deployment of the accent aigu. I can imagine a dialogue: "You liberals are such elitists!" "Actually, it's élitist." "So long as one has a resolution to the issue of feeling like one has meaning and purpose to life, a faculty gig at a research university is the best job in the world. I continue to be amazed that there are people with this job who have a sense of entitlement inflated enough to complain they are underpaid." "I know a professor who regularly complains about being underpaid to her department's secretaries." "She will be among the first against the wall when the revolution comes." "Which will be especially surprising to her since she sees herself as on the side of the revolution." Okay, so tracking my Weight Watchers points while traveling has proven difficult. Nonetheless, I was well-behaved the whole week, choosing to be skeptical about the text message I received from a friend on Thursday: Remember points don't count on your birthday. In any case, today was weigh-in day and I'm down a couple more pounds. 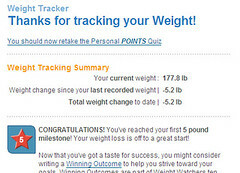 When I entered my weight, the WW site suggested that I should " Get some encouragement. Drop in on the Newbies Get Acquainted message board." Me, interacting with strangers. And here I thought I was doing well and they would recommend some kind of reward. Part of the reason I chose Weight Watchers Online in the first place was that someone who had been successful with it said, "You won't have to talk to anybody you don't know." You are excited to get the letter saying that your car loan has been paid off, and you realize that you can link to the post when you first bought it with no money down. At the Eastern meetings, I gave two presentations: one fell into the first category above, and one--the panel on Freakonomics--fell into the second. The main session vandal for the second was this guy who was apparently the spouse of a sociologist, but I somehow missed this and spent much of the time when he would talk thinking, "How can this guy be a sociologist and know so little about social science?" Anyway, fellow sociologists: if you want to bring your spouse (or child, or pet) along to a presentation, that's fine, but just like if you were going to a restaurant or movie theater, try to have them behave. If he is doing things like interrupting other audience member's points with asides where everyone is supposed to raise their hand if they've read Freaknonomics, that's not behaving. Another person in the audience wanted the panel to discuss whether Freakonomics was "the son of the Bell Curve," which I regarded as being too beyond ridiculous to know how to address and yet seemed to resonate with some other people in the audience. I suppose maybe I should consider it a victory that no analogies to the Nazis were drawn. * I haven't had this problem with any panels I've been on, but one consequence of the rise of internet in hotels is that one can't necessarily even count on the attention of fellow panelists. ** One may be more likely at ill attended talks to be on a panel with someone who is a crank or twit and does much to compromise the panel for everyone, especially if they go on for twice their allotted time with a presider who just lets them. trapped in a tin can! I was having a conversation with a friend on one of the couches in the lobby of the hotel. As we were finishing and I was about to stand up, she said, "Make sure you don't lose your wallet." I looked down and my wallet had fallen out of my pocket onto the couch without my noticing. Sara and I took the train here together for the Eastern Sociological Society meetings. I bought a salad at the station but forgot to grab a fork. I picked up my ticket off the tray and went back to the cafe car for one. When I came back, the conductor was coming down the aisle to take tickets. I reached into my pocket for my ticket and it wasn't there. I looked all around my seat, in my bag, in my coat pocket. I went back to the cafe car and looked to see if I dropped it. The conductor went by, clearly hoping I would just find my ticket and not have to call into motion whatever Amtrak machinery there is for lost tickets. I looked all around my seat again, my bag again, my coat pocket again. I had Sara stand up so we could look and make sure it somehow hadn't fallen underneath her or into her backpack. I looked all around my seat, in my bag. I checked my cell phone to make sure that I had the Amtrak confirmation number in case I needed it with the conductor. I looked all around my seat, in my bag, and there the ticket was, right there the first thing I saw when I opened my bag. I understand the logical inference is that it had been in my bag all along and I just didn't see it when I was going through my bag looking specifically for it, as opposed to the ticket having some kind of magical invisibility or teleportation properties. I said to Sara, "Welcome to my world. This is every day for me. It's like you just got to witness the ten minute abridgement of the story of my life." "I'm not that surprised. You have told me how in the last year you've lost your iPod, cell phone, coat--"
"Did I tell you I lost an air conditioner?" "How did you lose an air conditioner?" "Remember how I bought two air conditioners, even though I ended up only installing one. I put the other one down in the basement and--"
"Later you took it back to the store." "Oh, wait, you're right. I forgot that's what I did. Well, I can stop being perplexed about that." i barely have time for a blog with typos. i don't have time for a blog without them. Not that I mind having typos corrected. Just don't be surprised by their frequency and their occasional inexplicability. gondor calls for aid! oh, wait, it's just jeremy dressed up in his gondor suit again. 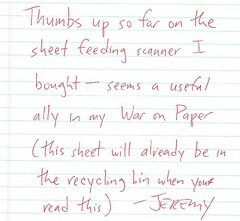 For reasons assuredly related to my ongoing plans to split the sociological atom, I am compelled to purchase a sheet-feeding scanner, preferably one from which it is simple to scan to pdf. If you have any recommendations or meta-recommendations--that is, recommendations about what would be a good way of going about finding a good recommendation--let me know. Completely unrelated: Is it just me, or does this AP story practically scream out the next major scandal in sports: dog steroids! Canadian Hans Gatt... said Mackey's [dog sled] team was the best-looking team on the Iditarod trail this year. Instead of tiring, his team recovered faster than any of the others after long runs between checkpoints and maintained their speed. You heard it here first: I'll bet my Floyd Landis bobblehead doll those dogs are juiced. URBANA, Ill. -- The University of Illinois swept aside the last vestiges of Chief Illiniwek on Tuesday, voting to retire the mascot's name, regalia and image. The school will continue to call its sports teams the Fighting Illini under the resolution. Chancellor Richard Herman is to decide how and when Chief Illiniwek's name and image will stop being used and licensed to apparel makers and others. The trustees do not say that the sociology resolution was the decisive development that led them to this vote, but obviously they're not going to publicly admit that, are they? I know what you are thinking: If only the ASA resolution against the Iraq war had passed before the war actually started. Update: Corrected to fix abominable error of saying "trustee's" instead of "trustees." I hate when I do that. Also, in case it isn't completely clear, my belief indeed is that Chief Illiniwek was an absurdly insensitive mascot without any defensible place in a contemporary university, and so I am very glad he is gone. I've started to use labels for my posts. I have also retrolabelled some posts, which I will probably continue to do--ah, like so much else in my life--sporadically and incompletely. Whether going back or going forward, I am not going to go labelloony, either in giving many labels to individual posts or thinking that a post is naked if there isn't some label stuck to it. I don't know if it is possible to include labels in my sidebar without having to entirely overhaul my template to the new style Blogger uses. If it is and I figure it out, I'll include them in my sidebar, as I know people are eager to be able to spend hours going back and re-reading all of my posts about karaoke or my short short fiction writing. The Kaplan story at UW-Madison is mercifully now in its denouement. Statements have been released by UW's chancellor and by almost all of the senior law faculty (including Kaplan himself). These seem like they will be good for helping move the issue out of the news and toward, to use the ubiquitious metaphor for such things, healing tensions at UW. As a social psychologist, the statements are interesting because they invoke the timehonored (and experimentally affirmed) strategy for reducing intergroup conflict--find a common enemy. In this case, the claim of common cause is against the media and other outsiders who are presented as having inflamed or distorted matters. Exactly what Kaplan said or didn't say remains in dispute. But there is overwhelming evidence, including reports from other students in the class, that he was making a valuable point about how the law can be an obstacle, rather than an aid, to displaced ethnic groups, such as the Hmong in Wisconsin. His discussion included references to Hmong culture and the effects of being a displaced minority, which offended some students. His criticism, however, was aimed at the failures of government and the law to accommodate Hmong people. It would be unproductive to tell any students in his class that because Kaplan was well-intentioned, they should not have been offended. They feel what they feel, and their feeling should be respected. But the rest of us have been called to make a judgment on Kaplan, a public employee at our state university. Is he a bigot? Should he be disciplined? The answer to both questions ought to be unequivocally "No." There are lessons in the incident for everyone. First, the reaction to Kaplan's remarks supports his point. It illustrates the frustration Hmong people feel because the rest of us have failed to give them the accommodation and respect they deserve. Second, we all ought to consider our freedom to discuss controversial issues, particularly in academia. If our professors become afraid of an inquisition over a phrase taken out of context or a discussion misinterpreted, how shallow will our university be? > I need someone to break the "W" insignia off of glass badger charms. > We have 50 more to do. Thanks! BTW, Can I blog this? Okay, so we hit a bit of a rough patch in Week Two of my diet. On Friday I ate three hot fudge sundaes and half of a cow. No. Kidding. 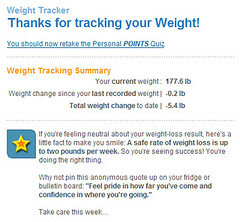 In fact, I've done fine with the diet part and am confident that I stayed under my points for the week, but I fell off the wagon of explicit tracking while I was in NYC and traveling meant that I did not get to do my weekly weigh-in on Friday like I was supposed to. So, I've made the executive decision that Week Two for me lasted nine days instead of seven days, and Sunday is my new weekly weigh-in date instead of Friday. As for the Week Two weigh in, I was just two-tenths of a pound below last week's weight, which didn't surprise me since I thought I didn't think I really lost more than five pounds my first week. I do feel like the elevator is going down and so feel good. BTW, I joined Netflix so I could watch TV shows while I am on my elliptical trainer. Let me know if you have any recommendations for TV series I should put in my queue. I watched a couple seasons of Buffy, The Vampire Slayer when I was in graduate school, but otherwise haven't watched series television in well over a decade, so I'm pretty teevee terra incognita. 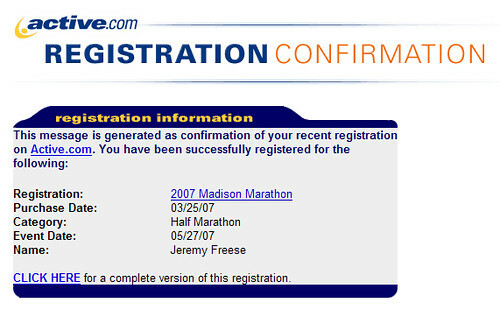 Of course, I joined just in time for it to be warm enough that I'll probably spend most days jogging outside, and then I'll just use my iPod as it seems like it might be dangerous to hold my laptop in front of my face to watch DVDs while I jog. Writing from a suspiciously large hotel room in the Hotel Lucerne on West 79th. Walking around New York City is less fun when it is really cold outside. And when you are by yourself. So I'm sitting here with room service and a book about the history of economics. It's a lot like staying in hotel rooms in other exciting places I've traveled to for work-related purposes, only with much more honking and shouting outside. "I'd ask you to say hi to [name] for me, but you won't." "Sure, I'll say to [name] for you if you want." "Say hi to [name] for me." "Of course, that means that you'll then be taken up as a topic of conversation. I mean, that's what 'say hi for me' really ends up meaning: topicalize me. So, would you like to be a topic of conversation between [name] and me?" "Okay, I think I'd prefer you not say hi to [name] for me." Meanwhile: My father turns 73 today. My father worked thirty years in a meatpacking plant and then retired (at least, from that job). It's amazing to think that was more than twenty years ago. Bloglines readers and people who have checked here in the past couple hours may have been confused by a recent post that seemed like it was meant for a different, more personal-productivity or diaristic-oriented blog than this one. Um. Well. Remember when I wrote the post that made an offhand reference to a writing pact? Um. Anyway. All gone now! Back to your regularly scheduled programming! I'm reading The Seven Habits of Highly Effective People by Stephen Covey. Or, to be completely honest, re-reading, as I have also listened to it before as an audiobook. I'm currently on Habit 5: Seek first to understand, then to be understood. 1. Actor [person/organization/member-of-Covey's-family] has problem. 2. Actor tries standard expedient solution to problem, fails. 3. Actor decides to try way that uses T7HoHEP wisdom, even though it seems unlikely to work. 4. Success follows, often greater and more immediate than Actor could have anticipated. Some of the details of this story have been changed to protect the privacy of those involved. I once had a friend who was dean of a very prestigious school. He planned and saved for years to provide his son the opportunity to attend that institution, but when the time came, the boy refused to go. And, I thought, I wonder if he has that footnote because he was using this story and someone somewhere pointed out to him that a dean at a very prestigious school would be able to swing some kind of tuition arrangement for his child as part of the deal. Okay, so ignore the timestamp, it's actually Monday at 4:10pm EST. Regarding the incident at Wisconsin linked from this post, Leonard Kaplan has made his statement. I've uploaded it here. Update, 8:30pm: The headline that seems to be going for AP news coverage of this is "Wis. professor acknowledges remarks about Hmong caused pain" (here). Is that really the best one-sentence upshot of this statement? Does one really have to be a thousand miles away from Madison to see that media coverage of this whole episode has been insane? I was having a conversation with my dissertation advisor the other day about a couple of articles he has published that have recently received attention from some major media outlets. Then, however, we turned on to the true star turn of recent years: my own appearance in an article on blogging in Footnotes, the official journal of the American Sociological Association. Small-town boy detective finally hits the big time, I know. If you mail me your issue in a self-addressed stamped envelope, I will happily autograph it for you. The interview was my attempt to push e-mail interviews to the next logical step by actually blogging the content of the interview as I was doing it (here, here, here, here). In the end, I just sent the reporter a set of links. If you read the article, see if you think my quotes read like a person writing for his blog rather than speaking to an interviewer. I think the reporter did a great job with the article, although perhaps I'm biased since I'm quoted at length. I would have liked to have seen more sociology bloggers interviewed, as well as URLs of the blogs of those that were. Eszter is also interviewed in the article, as is C.N. Le, who I don't know personally, and Rebecca Hensley, who I don't know at all. if they asked the faculty more broadly to sign this, i would sign. since they haven't, i will only link to it. Via Althouse: Statement of the Committee for Academic Freedom and Rights, University of Wisconsin-Madison. I could say more, but will refrain for at least the moment. Perhaps because I'm lame. Back when I was in college, I remember the campus newspaper ran this cartoon whose caption was "Madonna: 20 Years Later." The drawing was of some scary-hagly-looking-woman with the hint that she was doing something sexually outlandish (like something you'd hear about in a particularly adept telling of "The Aristocrats" joke) and there was a giant thought bubble coming out of her head that just said "LOOK AT ME LOOK AT ME LOOK AT ME LOOK AT ME LOOK AT ME LOOK AT ME LOOK AT ME LOOK AT ME." While twenty years have not yet passed since this cartoon, and it's not like Madonna hasn't had her share of artistic and psychological failures, she hasn't done that badly at maintaining her dignity as she has aged. The same cannot be said for Ann Coulter. Presumably at some point Coulter is going to say something that causes everyone on the conservative carpet--who knows about the conservative fringe--to dissociate themselves from her for real this time and when this happens, I can see conservative males murmuring to each other, "Plus she's long past being hot anyway." farewell, pebbles! farewell, little mermaid! farewell, daphne from scooby-doo! Via Dan: Will redheads be extinct by 2100? (Or, at least, extinct in terms of new redheaded children being born.) Barring intervention, it really is just a question of when, and offhand 2100 doesn't seem implausible to me. A question is, as red hair becomes rarer, will those remaining be want their kids to have red hair, or want their kids not to have red hair? If the latter, dissortative mating could bring the end of the auburn world as we know it even sooner. My guess is there will be more of an effort to save blonde hair and, even more, blue eyes. I have nieces with red hair and blonde hair, but the six identically brown-haired kids produced by my parents would lead me to suspect only one parent has recessive genes for hair lurking within (my father, since I have redheaded cousins on that side). My own brown eyes seem weirdly like they have become a bit greenish in recent years, which I've attributed to the DNA effects of the unfortunate latch on my microwave. So, several of the fellows in my program convened to, among other things, play this board game one of us (Damon) had invented. 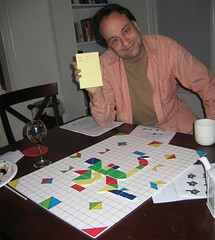 He currently calls the game "Tetrapolis", which literally means "four-part city", although we mostly liked its earlier name of "Tesselation", which literally means laying little colored tiles of different shapes down on a surface. The game involves laying little colored tiles of different shapes down on a surface. It's sort of a visual Scrabble for people who are good at thinking spatially and not good at spelling. The game is actually really simple and clever, although the rules sheet has a couple sentences like "In this sense, the game board is torosoidal" that might need to be edited by someone less mathematically-inclined than Damon before he starts selling it as "Ages 10 and Up." Damon has been having friends and family play the game but is still tinkering a bit with the rules. The above picture was taken to commemorate the fact that, on the first turn, my partner Kathleen and I laid down what was apparently the highest scoring Tetrapolis/Tesselation turn in the history of the game, and which Damon attempted to legislate out of existence as we were playing it. We also used all of our tiles (the equivalent of a "bingo" in Scrabble) on the second turn, establishing ourselves as the best known Tetrapolis players in the world, and causing everyone else to decide either to leave or steer the party toward playing Taboo instead. 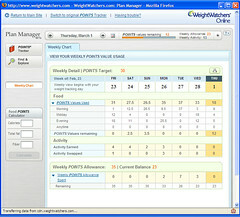 Weight Watchers has used the slogan "Give us a week, we'll take off the weight." As a methodological matter, when you compare a single measure taken right before an intervention with one intervention afterwards, the estimated effect of the intervention will tend to be overstated, at least if there is any way the high earlier measure was part of what prompted the intervention in the first place. So a year with an unusually high number of drunk-driving deaths prompts a state to pass a stricter drunk driving law, which then looks like it has a larger effect than it 'really' does because part of what had led to the spike in deaths the previous year was unusually bad luck. With weight, you have day-to-day fluctuation around one's 'real' weight, and so you might expect that people start diets after weigh-ins that are bad partly due to bad random fluctuation. This would then lead to the expectation of an unusually good first weigh-in followed by tapering off, although only for those people whose diets were prompted by a dismaying turn on the scale. I don't always enter the time of the meal in the right place, so it's not like there are days when I really blew all my points in the morning. 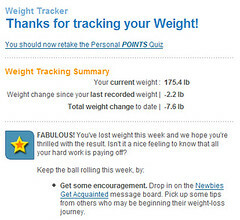 Also, if you look at the activity column, you'll notice I worked out fine the first four days and then stopped -- this corresponds to my portable DVD player breaking and thus rendering my elliptical trainer too tedious (a replacement part is on order, although I could also download an audiobook and listen to it on my iPod). Anyway, one week down, nine to go. I appreciate all who said they were rooting for me. The guy who commented and said he wasn't rooting for me is appreciated in his own, different, way. I had been with Diet Pepsi a long time, although no one would mistake our relationship for love. I mean, it was clear I would rather be with Pepsi or Coke, but a calorically-balanced life with either of these beverages at my side was just out of my league. Then I met Coke Zero and thought, "This is it! I have found the soulmate soft drink that will be mine for the rest of my life!" We were, indeed, very happy together. That is, until a couple weeks ago, when Coke Cherry Zero sashayed into the cooler of the market near where I work. Coke Zero, I realize now, was just love, not that love is nothing. Coke Cherry Zero is both love and a sublime spiritual experience.